Chris Wilder for Sheffield United hot seat? Sheffield United have placed Northampton Town manager Chris Wilder at the top of their wanted list after parting company with Nigel Adkins. Adkins' 11 month reign came to an end earlier today less than a week after he led the South Yorkshire club to a mid-table finish in League One. 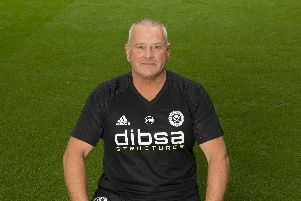 Although Bramall Lane's hierarchy have yet to hold talks with any of the individuals regarded as potential candidates, Wilder is known to boast admirers at board level after leading Town to promotion from League Two last term. United are expected to ask Town for permission to discuss the vacancy with Wilder who made his professional debut as a player for the club before returning for a second spell in 1998. Although Town chairman Kelvin Thomas would prefer to retain Wilder's services, he recently acknowledged: "We have known for a while that Chris and (his assistant) Alan (Knill) would be targets due to the fantastic success they have achieved." Both Wilder, a former United player, and Knill, previously of Bury and Rotherham, have release clauses written in to their contracts at Sixfields.